Can we use H-bridge in general PWM inverter? I want to ask, if I have a 0-12 transformer in place of a 12-0-12 transformer, can I use the same sg3524 based PWM inverter circuit by just using four Z44 mosfets in place of two by making the transformer lying between H-bridge? The linked image is for showing the idea. Original design of mine that has a sg3524 has loop from the output to automatically control voltage, etc. I showed the image just for showing how I am planning to connect the H-bridge. Re: Can we use H-bridge in general PWM inverter? yes. You should be able to do that. However you need floating (high side) gate driver for two upper transistor. The road of life twists and turns and no two directions are ever the same. Yet our lessons come from the journey, not the destination. ~ Don Williams, Jr.
How to do that? Any diagram? can you give me? That seems to be a complex solution. Isn't there anything that can be achieved by using passives like transistors, resistors, capacitors, diodes, etc. Hmm.., try this paper, toward end they have explained the totem pole driver "focus.ti.com/lit/ml/slup169/slup169.pdf"
But you would need floating power sullies any way. I've found that the circuit around the transformer and the mosfets were a h-bridge. Hopefully all MOSFETs survived the burn, but lots of SMD transistors, etc got burnt, and there's no possibility for me to get those parts and replace them. The original board used a general 8051 microcontroller, and for PWM it used UC3843 IC. I am unsure if they also survived or not. I've then planned to replace the board with a general sg3524 pwm board and use that as a general inverter. But I haven't worked previously with h-bridge and have worked with CT transformers in Inverters. Hence I need an easy solution to connect the two outputs from SG3524 to the h-bridge to run the inverter. Can you draw a simple paint diagram showing how to connect ? Any kind of help s really appreciated. The following circuit is a simple DC to AC inverter. This circuit can convert 12 DC voltage to 110/220 AC voltage. This inverter circuit generate square wave which can be used to power many device up to 120 Watts. Here is the schematic diagram of DC to AC inverter. The transformer used must can handle high current up to 10Amps. It’s the most espensive component of this circuit. The current flows alternately in through the primary windings of the transformer because the MOSFET is configured as bridge. Last edited by ALERTLINKS; 3rd September 2011 at 09:21. 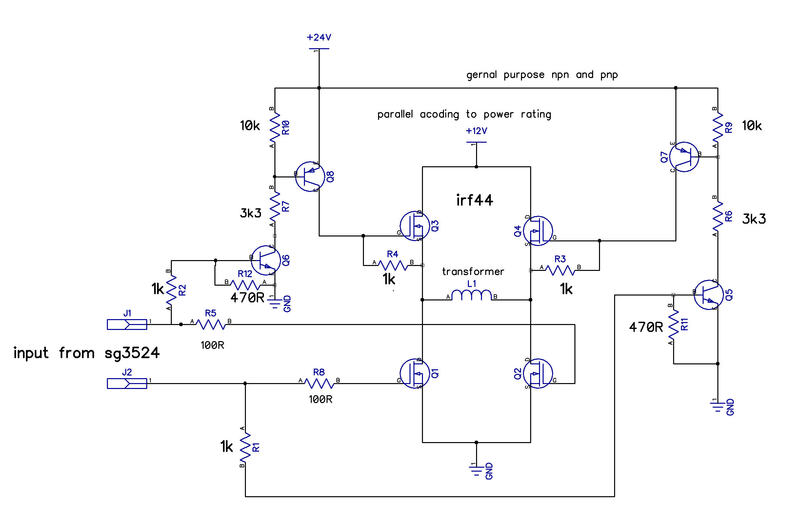 The following circuit is a simple DC to AC inverter. Simple indeed, but using complementary MOSFETs, surely not what Arup is asking for. Your plan involves designing a new inverter circuit instead of repairing an existing one. It's surely possible, but requires respective knowledge and measurement tools. Otherwise the project is likely to fail. Your plan involves designing a new inverter circuit instead of repairing an existing one. I also posted the circuit just for reference.I expected it to easily figure out how it can be done. The combined gates input of FET bridge circuit be connected to sg3624 ouputs through a 100 ohm resistor disonnectig driver transistor and pullup resistor also. Here pwm ic based cicuit is switching mode power supply for charging. It is seperate to inverter part. Mostly inverter winding of transfomer is of 8V not 12V for step sine wave. 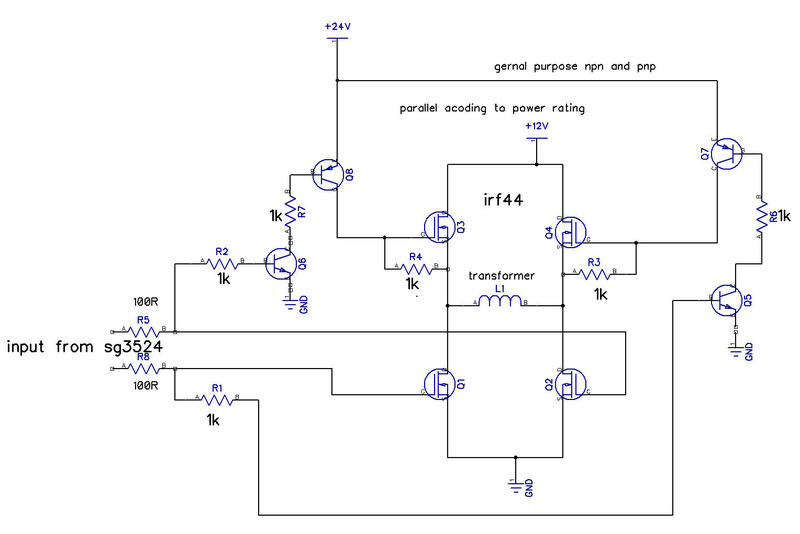 If you have to use irf44,You have to level shift for upper (hi side) FETs. Upper FETs are cofigured as source folower.It needs extra +12 above battery supply. A small 12V transformer with 7812 regulator can provide this by connectiing its -ve to battery positive. Swiching is diffent, needs seperate drive for each fet. Last edited by ALERTLINKS; 3rd September 2011 at 12:14. Your first design was of a squarewave one whose output is very poor, but the second one you showed, was perfectly meeting my needs. Thanks for that. 1. General purpose npn and pnp means? Won't hfe(β) be a factor? If that's not a headache, I'll be using BC548 and BC558. Is those OK? 3. How can I give 24V supply? Can I use a 555ic based charge pump based on capacitors that will give 2x voltage? Or I need a inductor and PWM based solution like the complex LM3311 ? If you can not arrange 24v for your circuit try this schematic. 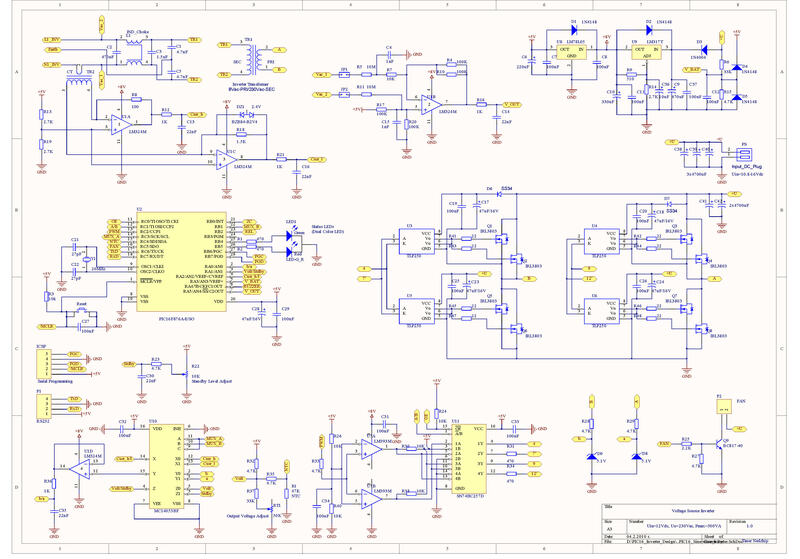 This is actually a 220v inverter,s schematic.You can see IRF840 used in it. But we can use IRF3205,instead of IRF840. This circuit also can generate 22volts(voltage doubler) for high side fets. An other h-bridge driver for 12v inverter is HIP4082IP. As i earlier said, small 12V ac transformer with 12V regulator can be used. Charge pump can also work if you are familiar. Thanks, but I'm wondering why you are asking for small 12V ac transformer with 12V regulator? If that's the way, I need another oscillator for driving another transformer for 24V which would be insane. Transformer primary is connected to out put of ups(may be to output socket). When mainis comming, it is providing required 12V as cooected to mains through relay. When main is gone, relay is swithed and now ups out put socket is conected with output of ups transformer and ups starts as filter capacitor on small 12V supply is still charged for the moment. when ups gives output, 220V is again provided to small transformer. There is one drawback, work with continues operation. A small 12V cell used in remote controls can be used for backup. Last edited by ALERTLINKS; 4th September 2011 at 10:34. Nice but that would not be a proper solution and will require mains to turn on UPS and we can't turn ON without that. Anyways, I've planned to use a charge pump by a 555IC (astable operation at 100Khz) and two diodes and two capacitors. But as my calculation, 12volt will boost to 22.8V not 24V (two diodes will cause drop of 1.2V). Is the 24V potential level critical? Or I can use that without any problem? Down to 8V+8V will normaly work, depends on gate drive voltage of specific FET. see in datasheet. The longer the discussion continues, the more obvious it seems to me, that an integrated bootstrap driver like IR2184 (with built-in adjustable dead time) would be the most simple solution. A discrete boostrap circuit as suggested by pnjbtr is probably the seond best, e.g. if you don't have access to gate driver chips. But it lacks important features like fail-safe behaviour with unsufficient supply voltage. SG3525 have internal deadtime. Yes it is better to use ics made to serve for that purpose. Another problem is when voltage for gate drive is less than required to avoid FETs to operate in linear region. ir2110 has undervoltage lockout. But i have seen simple circuits without any protections working flawlessly for years with comonents asembled hanging in air. Looking at them just confirms it wont last a day. And made by famous companies with alle type of protection like this one burnt without an obvious reason. So we can say you a Good Luck. If you like to do it,follow the thread. Last edited by ALERTLINKS; 7th September 2011 at 22:12. You can't connect it like that and it has been discussed as well. You would need a high-lo side driver - a floating gate driver for the high side. I would suggest you grab 2 hi-lo side drivers like IR211x/IR218x/L638x/NCP5181, etc. I think that would be the easiest way, although not the cheapest. However, that would also be the safest. If you can not get hold of such drivers (you should quite easily be able to get IR2110 at least), you can design one using discrete components - transistor,diode,capacitor, optocoupler, etc. pnjbtr has suggested one way.